Shop Celestion Heritage G1265 12 Inch Guitar Speaker 65 Watts from AMS with 0% Interest Payment Plans and Free Shipping. 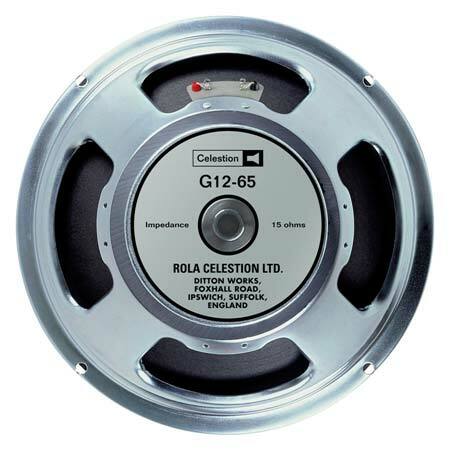 Originally created in the late 70s using more modern techniques and materials for a higher power handling, the G12-65 is widely regarded as one of the best speakers ever produced for use in a 4x12 cabinet. With its fast attack and tightly controlled low-end, the Celestion Heritage G12-65 became a favorite in the '80s with hard rock players and was quickly adopted by modern blues players such as Robben Ford. This Celestion 12 inch replacement guitar speaker provides a precisely tuned upper mids and crisp defined top-end, which contribute to an aggressive crunch sound that punches through the mix. The mid-range warmth and detail gives weight and substance to single notes playing. Celestion's Heritage Series guitar speakers are hand assembled in England and are faithful re-creations of the genre-defining loudspeakers that stacked up behind the most influential guitar players of all time. NOTE: 15 ohms speaker is compatible with any 16 ohms cabinet.